Considering a Steeltech home office? If you’re considering a Steeltech home office and would like to see what’s possible, you can just call to us at the Wexford Road Business Park on the outskirts of Carlow. We’re so sure that Steeltech is the perfect office solution, that we’ve just installed one ourselves! It’s already serving us well – and a Steeltech home office can serve you well too. First, we selected the size, and we opted for a 4m x 3m unit. Many other sizes are also available, if you need more or less space yourself. We then chose a tile-style roof and a woodgrain steel finish on the outside. 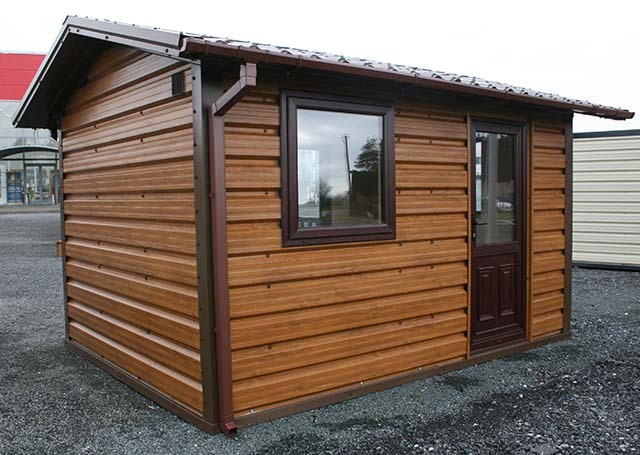 Other cladding and roof options include standard PVC steel cladding (in a choice of five colours), or a white vortex finish. Recent additions to other options are a vertical woodgrain panel finish, and a brick effect finish. 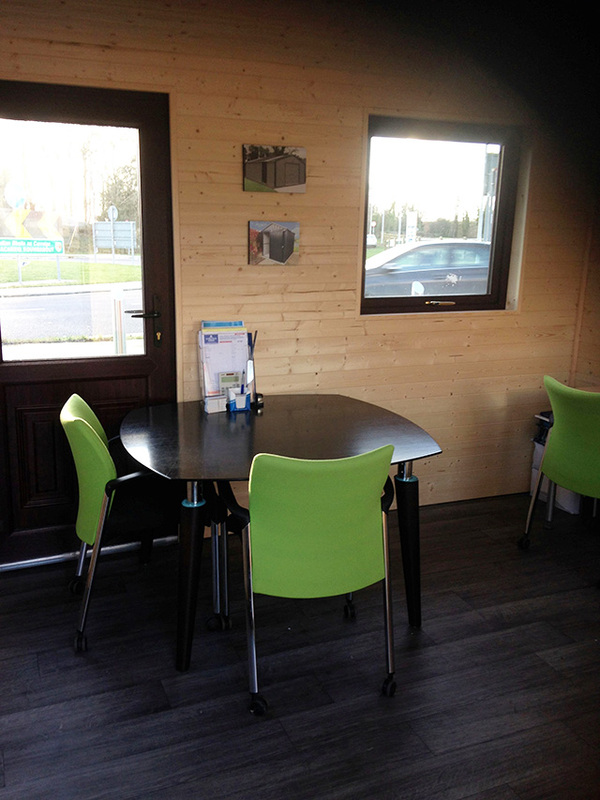 We then chose to install the office with two half-glass PVC doors and three medium windows. This gives us great light inside, and also enables us to see all parts of our display area outside. Our windows are 3’ x 3’ in size, but four different sizes are available, in numerous colours. All are double glazes PVC windows, for optimum thermal insulation. 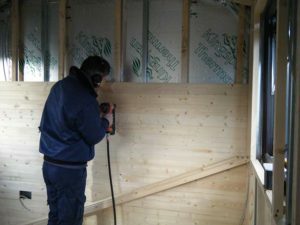 Internally, we first fitted Kingspan Insulation panels. These come as standard with all Steeltech home offices, making them easy to heat with even a small electric heater. 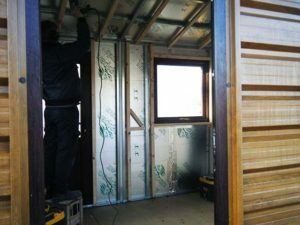 You can choose from 25mm or 50mm insulation. We then opted for a timer Tongue and Groove finish on the walls and ceiling inside. We wired the office for lights and sockets, and also installed a fuse box. This is done as standard for all customers who order a Steeltech home office from us. It means all they need an electrician to do is connect the office to their power supply. We chose to leave our office as an open plan space. However, we can also partition a Steeltech home office as per customer wishes, to create spaces for other work areas, a bathroom, kitchenette, or anything else. To learn more about all the options and come up with a design for you, just call to see us or contact us at your convenience. Best of all, we can deliver you a Steeltech home office no matter where you are in Ireland. Just give us your specifications and we will come up with a design to send you, along with a competitive price. When you are 100% happy with both, we will arrange for your new office to be expertly installed, in just a matter of days. 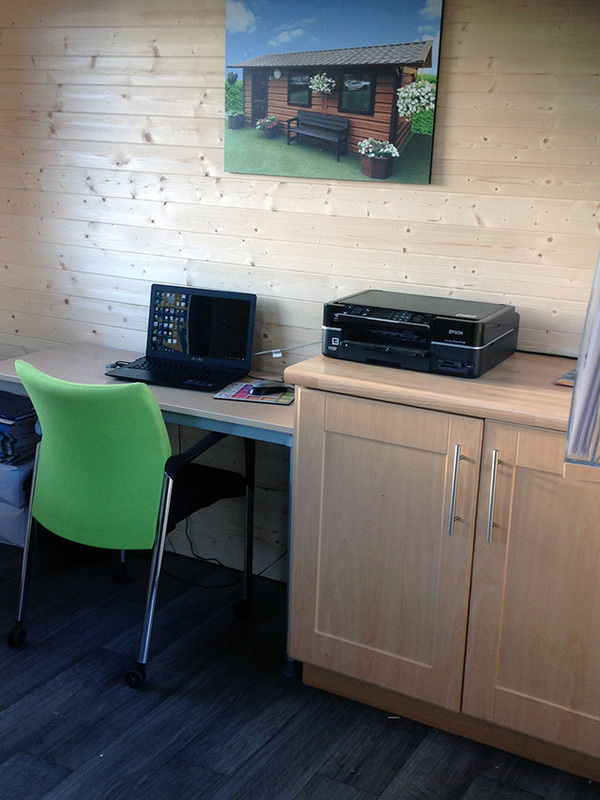 If you need extra space to work from home, or if you are fed up of paying high rent for office space and are looking for a cheaper alternative, a Steeltech home office is the perfect solution. Remember – just contact us, and let us bring that solution to you!